Is Dominos’ YouTube response enough? After the damage inflicted on its reputation by the YouTube video of its employees’ unsavoury conduct, Dominos President Patrick Doyle has responded with a video of his own in an attempt to reassure its customers. In the YouTube video, Doyle assures us that the employees have been sacked and it will do all it can to avoid a repeat of the incident, but is this enough to recover from the damage that has been done to the brand? As some of the comments on our original post on the video said, there is little Dominos can do to deal with this social media mess once the damage has been done, other than publicly condemn the practice and attempt to reassure its customers. However, Doyle’s response does look a little too scripted, and he doesn’t even look directly at the camera, which has the effect of making the response seem less sincere. Kudos Dominos: Rule #1:Don’t overreact . #2:Respond transparently, using the right channels (even if it’s “I dont know”). What more could they do? When it jumps that quickly from the web to mainstream media, is there a method to kill it? It’s somewhat uncomfortable to watch. I just keep thinking “at least look INTO the camera”! Agree with @ScottMonty #dominos weren’t prepared but they’re learning quickly. Look at camera? In my view, it looks more ‘genuine’. Digg, the popular content sharing website that lets users ‘vote‘ for their favorite content on the web, is a favorite of online publishers. 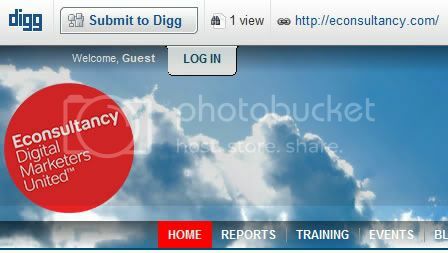 Get Digged enough and you might hit the Digg homepage, which can drive tens of thousands of visitors in short order. Currently, there are two ways to Digg content: on the Digg website or through a button that publishers place on their web pages. Econsultancy’s third annual UK Search Engine Marketing Benchmark Report was released last week; it profiles the UK search marketing environment, and covers paid search, SEO and social media. One of the trends uncovered by the report, produced in association with Guava, is that social media is becoming a bigger part of the marketing mix, with 91% of search agencies already offering, or else planning to offer, advice and services to clients on how to make the most of social media.